A gooey dissection of television pilot episodes. You have to be pretty cool to get applause just for getting out of bed. Apparently Gabe Kaplan was that cool in 1975. The opening scene of the pilot (which is listed as episode 2) of Welcome Back, Kotter consists of his wife, Julie (Marcia Strassman — Is it me, or does she look like she could be a Deschanel?) attempting to fold him up in their hide-a-bed. He leaps up and the applause track roars. When Robert Hegyes, aka Juan Epstein, died back in January I promised a post on this pilot, but never quite got around to it. (I do have a day job.) 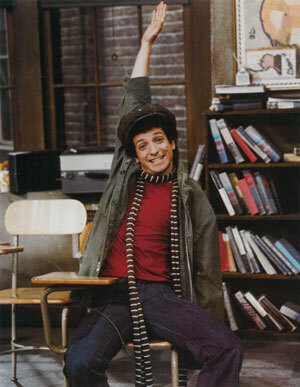 But I cannot let the passing of Ron Palillo, aka Arnold Horshack, pass unmarked. He may be the most memorable — certainly the most imitated — character from the show. Kaplan’s character, Gabe Kotter, isn’t looking forward to starting a new teaching job at his old high school in Brooklyn. In a lone, ill-fitting moment of narration he introduces the school and its principal, Mr. Woodman, “the kind of guy who drinks prune juice because he likes it.” He learns he’s assigned to teach a group of remedial students known as The Sweathogs. He was a member of the same “gang” when 10 years ago. Mr. Kotter is no straight man, but the real comedy routine comes from the four main characters in his class: Vinnie Barbarino (John Travolta), Freddy “Boom-Boom” Washington (Lawrence Hiton-Jacobs), Epstein, and Horshack. They introduce themselves in that order, a sort of hierarchy within their social order. Each one has a fairly significant monologue to introduce his character, something would certainly have been handled differently for today’s shorter attention spans. For a gang, these kids all look pretty harmless. Even, Juan the supposed tough guy, is more clown-like than intimidating. His introductory speech consists of an explanation of his ancestry. The inherent joke of the Hispanic first name/Jewish last name didn’t dawn on me as a kid watching the show, but much is made of it in this episode. Horshack comes last. He is essentially a puppet of the other three guys. He only speaks when asked to and he does impressions on command. His small stature, hound dog face, and pronounced Brooklyn accent make him almost cartoonish. It’s amusing but a little bit sad. If I remember correctly, over the years he became the show’s closest thing to a tragic character. And, you know what? Vinnie Barbarino was talking about himself in the third person way before it was cool. (Ok, it’s not even cool now, but it’s not uncommon.) Barbarino seems to be the primary puppet master and kind of a jerk. There’s potential for either a real friendship or a deep hatred between him and Horshack. Kotter and Barbarino have an insult contest, comparing zingers like “You had an idea once but it died of loneliness,” and “I hear your sister’s rotten to the core (corps) but wonderful to the infantry.” Kotter cleverly turns this volley of wordplay into a cultural anthropology lesson. Mr. Woodhouse is too much for him, though, and he storms out. I don’t buy that he’s on the verge of quitting. The sparkle in his eye betrays him. The kids wind up talking Kotter into staying, and stealing his television in the process. Again we find Horshack at the bottom of the heap; Barbarino has led the group in tying up Horshack and stealing his taxi. All of the suggestions of crime and violence, however, are delivered with a wink and a nudge, and we know everything is going to work out just fine. Even for Horshack. This entry was posted in 1970s, Comedies and tagged Arnold Horshack, Gabe Kaplan, Juan Epstein, Marcia Strassman, Robert Hegyes, Ron Palillo, sitcom, teacher who makes a difference, Welcome Back Kotter by meekthegeek. Bookmark the permalink. Writer, animal lover, environmentalist, pop culture fanatic, and Star Wars fan.